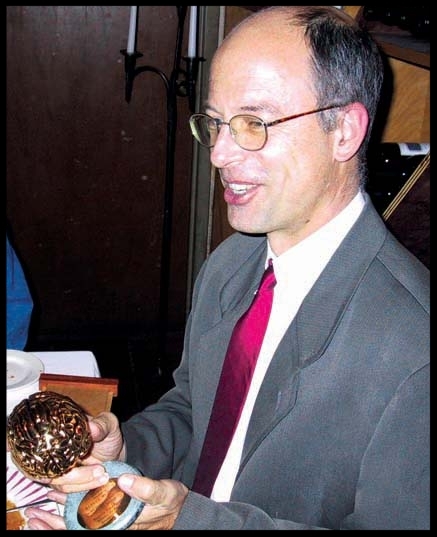 Harvard University’s Markus Meister, PhD, was the recipient of the 2005 Golden Brain Award from the Berkeley, California-based Minerva Foundation. Meister, professor of molecular and cellular biology at Harvard, received the award at a private ceremony November 14th in Washington, DC, where he was attending the 35th annual meeting of the Society for Neuroscience. According to the Foundation, Meister’s research revealed surprising ways that sensory organs, specifically the retina, are organizing and coding information before sending it to the brain. “He is doing the most innovative work in the field,” said the late Elwin Marg, PhD, director of the Minerva Foundation and University of California at Berkeley professor emeritus. “We thought the brain did almost all. Now we know complex processing takes place in the retina,” Marg said. Scientists have long held a simplistic view of the retina, Meister said. “People believed that the sole function of the retina was to convert light to nervous signals and the brain did most of the work that was involved in seeing,” he explained. That’s because previous studies had measured signals of just one or two retinal neurons at a time. Meister developed an electrode array that allows him to measure impulses from up to 100 nerve cells simultaneously. He found that groups of cells were firing in synchrony, sending coded information to the brain. “We found that the retina is doing computations on images that people thought previously were happening in the brain,” Meister said.